Ava is a 4 year old (12/26/11) sheltie or Shetland sheepdog. Ava is also the 452nd dog rescued by BDRA! Ava was purchased as a puppy and spent her entire life living in an outdoor pen. 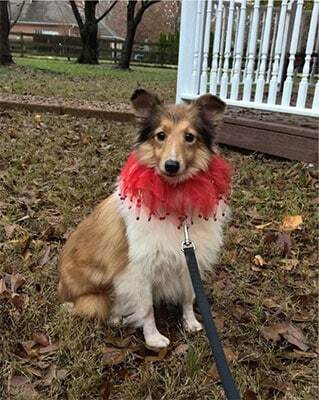 Ava was originally rescued by Fresh Start Sheltie Rescue. Ava was missing fur on her back and legs. She also had hair missing from the tips of her ears. Luckily, Ava was brought into foster care so her wounds could heal. While in foster care, it was discovered that Ava was blind from retinal atrophy. 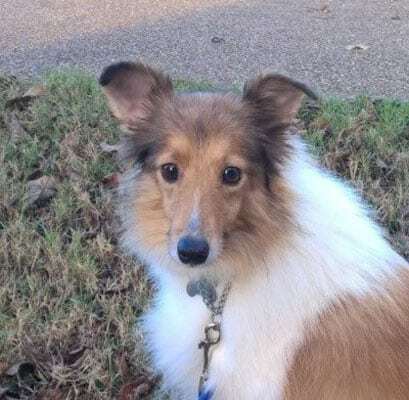 So, Fresh Start Sheltie Rescue transferred Ava to Blind Dog Rescue Alliance. Ava received no socialization in her former life and because of that Ava is still very shy and scared of people and loud noises. Ava still needs a lot socialization to build her confidence and trust of people. As Ava’s foster family, we try to balance between giving Ava attention and giving her space. Ava is still learning her name, but will not come when called by name. And at times, Ava runs away from fear or confusion. Ava will also cower if you stand above her. So, we are careful how we approach her. Luckily, our yard is entirely fenced. And Ava can climb up and down our deck stairs, the only stairs in our house. Upon adoption, Ava will need a home with a fenced in yard because she will run away, and if outside of the yard or house she will need to remain on a leash for her safety. Ava is learning to sit. Whenever she sits, we say “pretty sit” to help associate that action with the word. Since Ava won’t come when called by name; we often have to carry her outside to go potty. Ava doesn’t fight when you pick her up. In fact Ava loves to be held on your lap and petted. Ava will allow you to hug her and kiss her on the head. Ava is house broken. However, we have had some terrible weather recently (snow, rain and wind). So, Ava did have some accidents in the house. Luckily, she used the puppy pads we have down for our other foster. Ava was also a model patient at the vet office. Ava and my 4 furry girls, who are larger, have done great together. That’s because Ava is so docile and submissive. However, I think she gets a little overwhelmed when my girls are playing or barking. Ava has been very quiet and only barked twice since being here. I was mixing dinner for the big girls and I guess she was afraid we’d forget to feed her. Ava has been brave enough to follow the other girls through the house, especially to the kitchen. Ava makes for a cute little beggar. I honestly think Ava believes her name is cookie, because she will run into the kitchen when I say cookie. Ava is so gentle when taking a treat or cheese from your hands. Ava loves cheese! However, you have to be careful with Ava’s size and breed so she doesn’t become obese. Ava also likes to chew on chews. She also has a fondness for wicker, but every foster pup has chewed on this particular dog toy basket. Ava does very well in her crate and we feed her in her crate twice a day. Ava knows the layout of the house and back yard. My one concern is that she drinks enough water. We do keep a dish of water in her crate which is in our bedroom. However, when she is in the kitchen I continue to show her where the water dishes are by touching her feet to the mat and touching water to her nose. Ava has done great in our house and has the run of the house when we are home. When we’re away, Ava either stays in her crate or in a sectioned off area of the house away from our other girls just to ensure everyone’s safety and no personality conflicts. Ava likes to snuggle up on one of our many dog beds and nap. And she has the cutest little snore. Ava also has a lot of nicknames, like football. Since she is brown and when you pick her up you feel like you’re headed for a touchdown! We also call her Kitten because she is the size of some cats, or we call her Peanut. I feel that Ava deserves a nice, quiet older family of her own with no children. Ava would also do well with a family that has proven experience working with unsocialized dogs. Ava would love a family where she can sit on someone’s lap or be carried or pushed in a dog stroller. We haven’t had the chance to work with her on a leash yet. However, she will allow you to put a harness and leash on her. Ava wears a collar with her ID tags. When Ava arrived in foster care, her tail was tucked so tight between her legs that she looked tailless. The good news is Ava’s tail is slowing coming out from between her legs. Ava is making progress, but she will need a patient and loving family to help her learn love and trust. Ava is looking for her forever home. If you think it could be yours, read more about Adopting from BDRA before submitting your application below. BDRA relies on your donations to rescue blind dogs around the United States. Please consider giving in support of Ava.